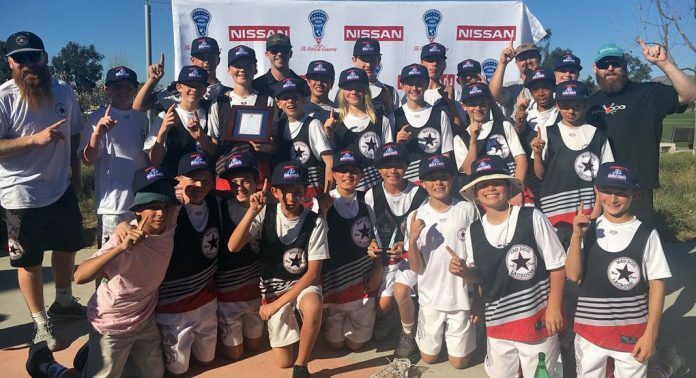 Mad Dog West, a U-13 team made up of players from LA, Orange County and San Diego, went 6-0 to win the West Regional Qualifier at Irvine’s Great Park on Feb. 17-18, earning a spot in the World Series of Youth Lacrosse tournament to be played in Denver in July. Mad Dog defeated Team Colorado Outlaws 4-2 in the title game after beating Team 5280 (Colorado) in the semifinal earlier in the day. In pool play, Mad Dog West beat both of those teams, along with LaxNW Rippers (Portland, Ore.) and Trident Select. In its six games, Mad Dog West outscored its opponents 55-15. Trident Select and OC Express each went 1-4 in the event. Last year, OC Express beat Team Colorado Outlaws in the West Regional’s championship game, earning the trip to Denver. Mad Dog West lost Express in the semifinals but earned a berth in the WSYL event by winning the third-place game in the qualifier. The tournament victory means Mad Dog West again will compete in Denver over the July 4 weekend in an event televised on ESPN. Lane said the Mad Dog West squad hasn’t lost a game in three tournaments over the fall and winter season. The squad will tune up for the WSYL by competing in the Vail Lacrosse Tournament on June 18-20.